Home DIY Projects	Pull-Out Drawers in the Pantry!! Happy Tuesday, Everyone! Guess what my sweet husband did for me yesterday? He installed pull-out drawers in our Butler’s Pantry!!! I really feel like 3 exclamation points aren’t nearly enough to describe my happiness. Come see how they look! Ok. This is where we started. Previously this was a broom closet. It held the central vacuum hose, a broom and a mop. Not very glamorous, and certainly a waste of valuable space! In case you missed it, a little recap. When we moved in this house we loved the fact we had a Butler’s Pantry. In fact, it has always been a dream of mine to have one! However, this one was not quite what we envisioned. This is how it looked when we moved in. Tons of square footage and tons of potential. So, we remodeled it! To read more about the Butler’s Pantry Remodeling Project click here: Butler&#8217;s Pantry Reveal! After months of hard work, it looks like this! I finally won this battle and he agreed to convert the broom closet to a food pantry. First, we went to Lowe’s with plans to special order the hardware and drawers there. However, they were very expensive! One set of hardware to mount the drawers was over $100 each. Their specially made drawers were around $55 each. Yikes! We decided to do a little research at home and my husband, Brad, found identical hardware for around $25 each through BLUM, via build.com. Their drawers, also custom made to fit our dimensions, were around $70 per drawer from cabinetdoorworld.com. A very big savings! The down side is the drawers took 6 weeks to arrive, even though they are made locally in Hickory, NC. The drawers and hardware have been sitting in our garage for about a week waiting for a rainy day. So, it all came together yesterday! Working from the bottom of the broom closet up, Brad installed the lower hardware and drawer. He had to cut spacers to fit on the back of the cabinet and sides in order to fasten the hardware. (So that the drawers will clear the opening of the cabinet and hinges.) He said the first two were the most difficult. After that, it was a matter of measuring and making sure everything was level and properly spaced. He used a combination of wood glue and pneumatic finishing nails to affix the wood and hardware to the cabinet. And here it is!!! Pretty amazing! We need to allow the wood glue to set for 24 hours before stressing the joints. But didn’t Brad do a fantastic job? It’s wonderful to have a husband who is so handy! Not bad for a former Chief Operating Officer. I can’t tell you how happy this makes me. Before, all of our food was divided between all of the cabinets on the lower two shelves for easy reach. It was a guessing game trying to remember which cabinet held the green beans or the bread. So I ended up opening several doors to find what I was looking for. A perpetual game of “Where’s Waldo”? Now I can simply open the double doors to the pantry and pull out the drawers. All of our food items will be in one place and easy to find! Hallelujah! In the cabinets that formerly held food, now will hold china and other serving pieces I have stuffed in my sideboard and china cabinet. Plus, my favorite serving pieces will be within easy reach without getting out the ladder. 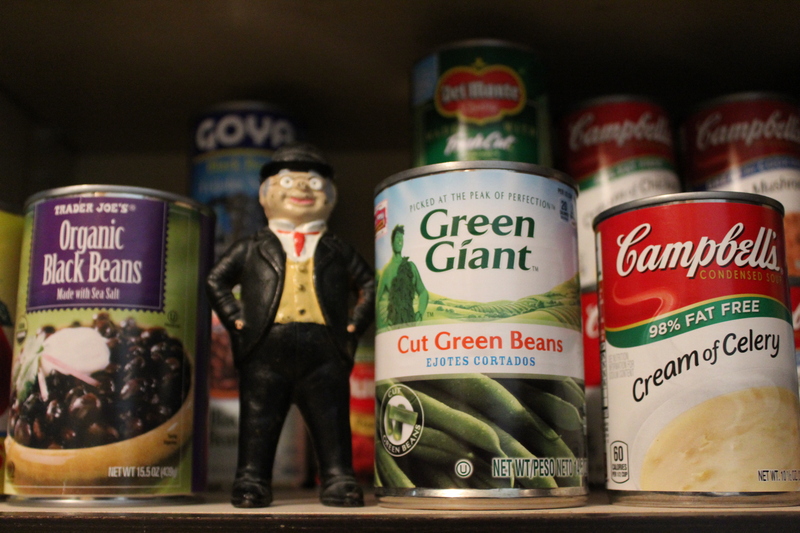 I can’t wait to get my Butler’s Pantry reorganized! And so I’m grateful my husband is able and willing to do things like this in our home. Thank you, Honey!! The project cost is probably between $500-600 dollars, but we saved a ton of money by ordering the materials online and Brad doing the installation. He’s happy we saved so much money and I’m happy I have my beautiful Butler’s Pantry, complete with pull-out drawers! How to Organize Pull-Out Drawers in a Pantry!